Come January and Jaipur city becomes a riot of colour. Tourists make a beeline for the Jaipur Polo ground, the venue where the annual Kite Festival is held. The kite festival has an international reach as it invites the best kite flyers from across the world to participate in the contest, showcasing their kite-flying skills. 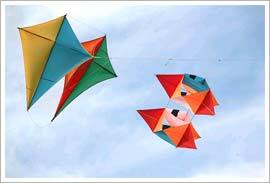 The festival is celebrated, usually to commemorate the occasion of Makar Sankranti that falls on the 14th of January. The festival begins on a grand note, with Air Force helicopters marking the exhibition phase. The helicopters release a mind-boggling variety of kites. Every kite has its unique design, colour and dimensions. The kite flying competition provides a platform to showcase the participants’ kite-flying skills amid intense rivalry as one realizes a lot is at stake, in terms of awards and prizes. Kite makers flaunt kites sized as big as 1.5km of various shapes and designs. Some Kites carrying messages and themes, some depicting social issues, some bearing caricatures of politicians; all can be seen here. The kite festival has emerged the most popular event in recent times what with even tourists being allowed to participate in various kite flying competitions. The sky is loaded with colour and more colour as the numerous kites are flown in a spectacular display. In Udaipur, the three-day festival concludes at the Umaid Bhawan Palace, with glittering prize distribution ceremony.